Small entrepreneurial and growing international plant-based ingredients manufacturer. US office located in New Jersey / NYC area. Lead sales function and direct sales team in plant-based protein powder and raw ingredients industry, including rice and pea proteins. - 7+ years of related Sales experience in the Food & Beverage Ingredients industry, Plant-based Proteins ideal. - 5+ years of experience managing a sales team. - Proven ability to sell ingredients to multiple buying influences, including purchasing, marketing and R&D. Joe has a Master’s Degree in Human Resources from Marquette plus 14 years of recruiting experience in the food and beverage industry at Kinsa. In addition, he started his career as an HR Generalist at a Food Processing Plant in Milwaukee. 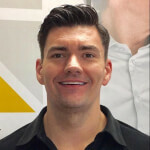 As a Kinsa Account Manager he is the primary business development contact for many of our Dairy, Food Ingredients, and Seafood category accounts. Let Joe put his network of food industry professionals to work for you when you’re in need of your next top talent professional, manager, director or vice president.